I’ve only recently, at the beginning of my fifth decade of life, started exploring the richness of 1950s ufology. As a child of the 1970s, my formative UFO matrix exists at the nexus of the uncanny and horrifying child-Greys toddling down the gangplank of the mothership in Close Encounters of the Third Kind (1977), the combination of the reassuring avuncular tones of Leonard Nimoy and the finest in late-’70s synth on the television series In Search Of… (1977), and an obscure “documentary” film, UFOs Are Real (1979), a.k.a. Flying Saucers Are Real, written and directed by schlock sci-fi director Ed Hunt, which aired every few months on WSBK-TV 38 in Boston in the early 1980s. It was indeed a glorious time for ufology, with various Aquarian movements and occult philosophies wending their way into the cultural mainstream. So it’s no wonder that 1950s ufology, a wild and woolly mélange of hairy dwarves and Nordic supermen, didn’t hold much appeal for me. The first generation of UFO contactees were recapitulating forms of older mystical and psychic contact with angelic higher powers, like the angels of the Swedenborgians, Blavatsky’s Ascended Masters, or the “I AM” movement’s Comte de Saint-Germain. In those dozen or so years after Kenneth Arnold’s sighting of “flying saucers” in 1947 (and yes, let’s please put aside Roswell for the time being, which really only gained its preeminence in ufology as a 1980s-and-later urban legend), we have the classic example of the messy formation of a mythology, with threads and stories mixing and remixing, and eventually gelling into what became the standard tropes of late-20th century ufology. Over the past few months I’ve had occasion to comb the shelves of my local occult bookstore (Seven Stars in Cambridge, Massachusetts) for tomes related to ufology. (We’ve all heard the tales of the death of UFOs as a field, and at Seven Stars this trend is well-represented; less than one full bookshelf of UFO books is all that remains of what used to be a fairly large collection.) On my most recent trip, I was drawn to a hardcover from 1956 titled Flying Saucers and Common Sense by Waveney Girvan. The book itself is a fairly routine but detailed account of the state of the field in the mid-1950s: name-checks to Charles Fort, airship flaps from the late 19th century and first half of the 20th century, and the first decade of Cold War-era ufology. This latter portion of the book includes a great deal of material on George Adamski, the early “contactee” par excellence, who peddled his photos of hubcap-shaped UFOs and tales of friendly greetings from blond Venusians throughout the early 1950s. Girvan himself states in his own introduction that he straddles the line between believer and skeptic; indeed, his first two chapters are titled after what he sees as the “will-to-believe” and “will-not-to-believe.” Girvan does seem to be drawn in by Adamski’s multi-layered, multimedia narrative of meeting beneficent Venusians in the deserts of remote southern California. Allingham – a wealthy amateur disappeared – and friends, in long search, have found no trace of him, or where he has gone. I hope I’m not too off-base in stating that this is a pretty arresting set of annotations. I stood in Seven Stars just staring at this tale of UFO-related disappearance, wondering if I was falling into an Umberto Eco-like conspiracy narrative after years of skating along the edges of ufology and the occult. I bought the book. How could I not? And then I decided to do some research. 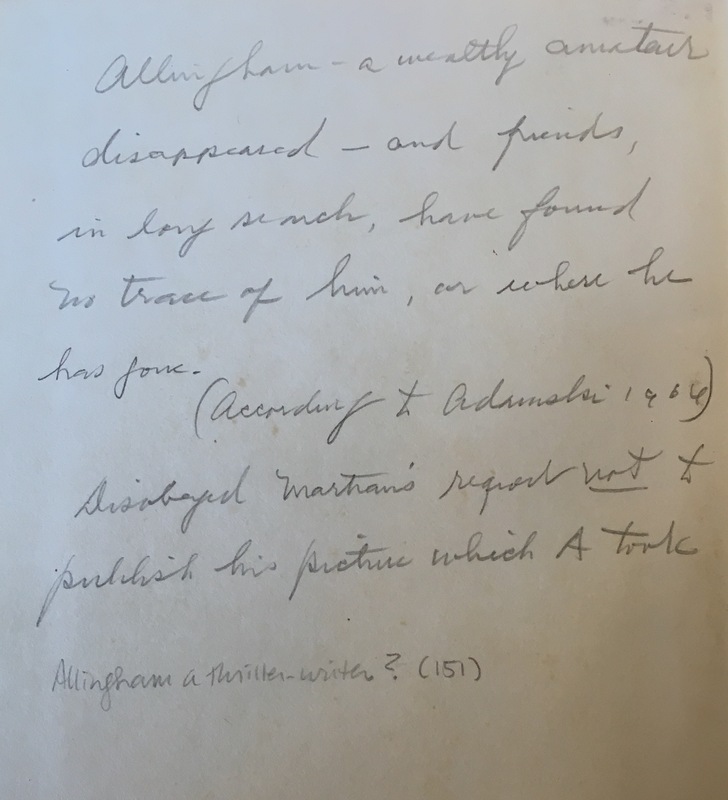 Sadly, in the era of Google and Wikipedia, it didn’t take long to unfold The Allingham Mystery—but let’s take this narrative the long way ‘round and expand on the players named in the mysterious inscription. First, I assume the inscriptions were placed in the book sometime in the two decades between 1966 and 1986. Presumably the “1966” refers to the publication date of the 1966 edition of Adamski’s Inside the Space Ships (1955). We also have to assume that the inscription was placed sometime before 1986 (we’ll see why in a little bit). So this copy of Girvan was in the hands of someone who was desperately trying to find out about Cedric Allingham, the subject of the seemingly tacked-on Chapter 12. So let’s see what Girvan says about Allingham. Chapter 12 of Flying Saucers and Common Sense details the late-breaking story of one Cedric Allingham’s 1954 encounter not with Adamskian Venusians, but with Martians. 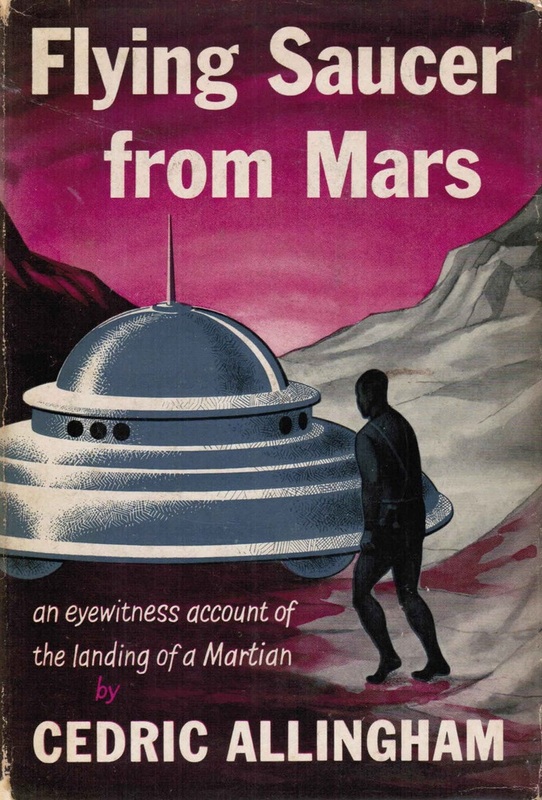 Published as Flying Saucer from Mars (1954), Allingham’s book was, at the time of release, seemingly a British version of the Adamski story, even containing photos of a nearly-identical saucer to Adamski’s, if a bit blurrier. Allingham’s book even received a lengthy notice in Time magazine! Here, Allingham’s background was fleshed out to include his career as a “thriller-writer, amateur stargazer and bird watcher,” but also his stay at a Swiss sanatorium for a respiratory ailment. The fact that Allingham sent his manuscript in for publication hot on the heels of Adamski’s Flying Saucers Have Landed definitely set off Girvan’s suspicions: “Although in 1953 it might have been difficult to place a sensational book on flying saucers with an English publisher, in 1954 the situation would have altered.” Moreover, no one could find Allingham to speak with him, despite many attempts. The aforementioned stay in the Swiss sanatorium, secondhand accounts of meetings with Adamski in the mid-’50s, a purported single public lecture, and the sole photo of him, an author’s photo in Flying Saucers From Mars, added to Allingham’s mystery. It took three decades for the true identity of Allingham to be revealed. In 1986, Magonia magazine’s Christopher Allan and Steuart [sic] Campbell published a full investigation into the identity of Cedric Allingham, taking as its starting point four pieces of extant evidence: a lecture that Allingham supposedly gave in Kent before his disappearance, stylistic quirks in Allingham’s text, the aforementioned author photo, and returned correspondence with Allingham’s publisher. You can read the full narrative of Allan’s and Campbell’s detective work at the above link; I’m not going to repeat it here, but it is a tremendous work of journalism in a world that is often cloaked in intentional obfuscation. Because—yes, Virginia—there is no Cedric Allingham. 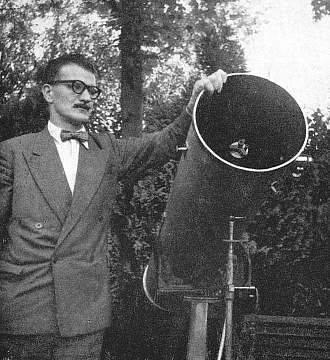 He is a pseudonym for two men: Peter Davies, the man in the author photo standing next to a 10-inch reflecting telescope, and Patrick Moore, the owner of the pictured telescope and the actual author of Flying Saucer From Mars. Moore had devised the hoax as a riposte to the very wave of flying saucer books heralded by Adamski in the mid-’50s. Moore was, among other things, a lifelong bachelor and confirmed woman-hater, an old-school follower of the Enoch Powell school of English xenophobia, an opponent of fox-hunting and animal rights activist, a proponent of the monocle, a virtuoso on the glockenspiel, and, as we’ve seen, an expert baiter of the UFO-credulous. He went on record on several occasions denying the existence of UFOs and debating UFO proponents on television. And, spurred by this wave of Adamski-inspired saucer talk, he decided to present the public with a copycat tale of UFO contact, replacing Adamski’s Venusians with Martians and photographing a near-identical craft. There’s actually a second inscription in the “second hand” on page 152 of my copy of Girvan, a handwritten, asterisked footnote near an account of Allingham’s photos being exhibited in a British newspaper next to pictures of spinning tops: “*What about the chicken brooder or whatever? I’ve never seen a photo of that, incidentally.” This is a reference to the similarity of both Adamski’s and Allingham’s saucers to a chicken brooder heat lamp, as can be seen in this illustration from The Anti-Gravity Handbook (1985) by David Childress. One might imagine that Moore, in his time in the English countryside, perhaps enjoying a stroll on a farm or two, had recognized Adamski’s saucer for the chicken brooder it was and decided to bait Adamski by photographing an identical model of the heat lamp for his own alter-ego’s book: a lively example of expert, pre-internet trolling. And that’s all the more reason to admire Moore’s hoax: he never admitted to it, even after being confronted by the Magonia authors in the 1980s! Moore made some legal threats in the aftermath of the article but never followed through on them, staying mum right up to his death. Again, it’s just like a classic English eccentric (or a dedicated debunker) to go through the trouble of getting a book published just to leave it hanging there, mute and uncommented-upon, for more than a half-century: a silent, playful, ironic testament to his own ironclad UFO skepticism. 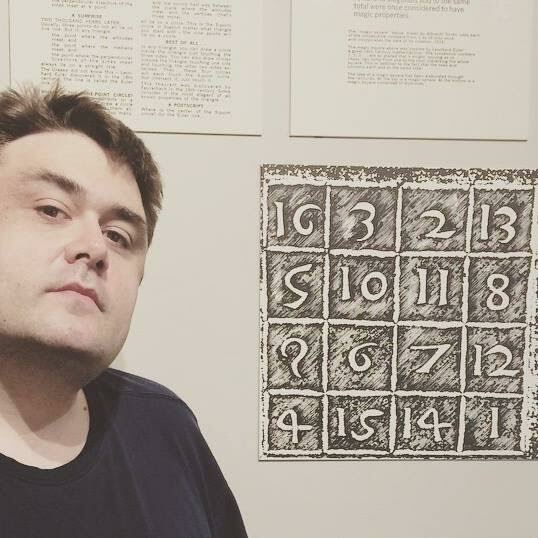 Michael Grasso is a Senior Editor at We Are the Mutants. He is a Bostonian, a museum professional, and a podcaster. You can read his thoughts on museums and more on Twitter at @MuseumMichael. Ummm…wow. I don’t even know what to say after reading all that. It is really bizarre to have found that little annotation in that book though. Talk about super ultra-random! It was fascinating to see this little ufological time capsule, in the form of the inscription, from the period between Allingham’s putative encounter and its debunking in the ’80s. It was fun to have some goalposts provided so I could date the inscription between ’66 and ’86, although I suppose anyone who didn’t read the Magonia article could have left the inscription later than ’86.